Not my brother Joe. Another Joe. i lost him about a week ago. Saturday, Maureen and i drove to Huntington Beach to pay our respects and a great deal more. It was a small gathering, perhaps on the plus side of twenty. In the home of Joe’s brother Gary. A quiet service devoted to remembering Joe, telling stories, and yes, quite a bit of emotion. i didn’t spend a lot of time with Joe. He was frequently with his sister Janet when we would see him. Janet and her then husband, Frank Kerrigan, met us when i was the executive officer on Yosemite. 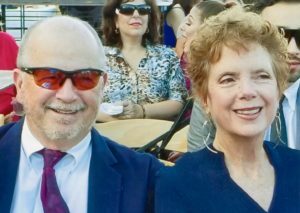 Both fresh out of the University of Chicago med school, Frank was the ship’s doctor and Janet was one of the doctors at the clinic on the Mayport (Jacksonville) Naval Base, Maureen’s doctor. This was right after Maureen and i got married and the two were a integral part of our first year together. They are the godparents of our daughter Sarah. The two left the Navy and created a successful primary and urgent care facility in Palm Desert. When we went to see them, Joe was often there. Joe Hill is quite possibly the nicest guy i have ever met. i could immediately tell Joe cared about me and about Maureen. We were old friends within minutes of our first meeting. It was always a feeling of happiness i would get when i found out Joe was part of our time with the Kerrigan’s. Jan and Frank had a good divorce, if there is such a thing, and they, along with their new spouses, Deborah for Frank and Greg Mokler for Janet, continued to include Joe in their activities. The last time i saw Joe Hill was at Frank’s retirement party at his home in La Quinta. Joe had not changed one bit: full of energy, full of corny jokes, and overflowing with empathy. Another thing about Joe: whenever we left some get together like the retirement party, i would find myself wishing i could spend more time with Joe. i no longer have that opportunity. Joe was a bit different from most folks i know. He was smart, practical, fun and chose window washing as his career. It wasn’t as if he had no ambition. It was as if he chose that profession simply because he liked it. Joe did things Joe liked to do. Our world is not kind to people who are nice and do things they like to do and don’t make waves, don’t make judgements but accept people, everyone without judgement, love life as it is. About a year ago, Joe came down with some health problems. They lasted six months or so. His window washing business went financially down hill fast. Joe suffered from depression. He drank too much. About a week ago, he killed himself. Joe was a dedicated Christian in his own way. He read the Bible at least twice a day. i did not know that until Saturday. It made sense. He was the kind of Christian that followed Christ’s teaching. He did not judge, he did not throw stones, he loved. As his sister said at his memorial, Joe was ready to go to his heaven in which he so strongly believed. i’m sure he is there. And we have a void. At the service, numerous people told stories of Joe, things i would have never suspected but made sense. Funny stuff. Living life to the fullest stuff. Joe Hill. So Joe, all i can say is i will never forget you and the way you lived. It was an inspiration and, Lord, oh Lord, i wished we had many more like you. So beautiful, thank you my friend. Joe would be so touched by your words. Thank you so much for this. He was a great man and an amazing uncle.